This photograph shows the fruiterer and florist shop which once stood at 204 / 204A Heaton Road, the premises now occupied by Heaton Property. The photograph was taken in 1911. On the right is Florence Webb, the grandmother of Heaton History Group member Les Turnbull. 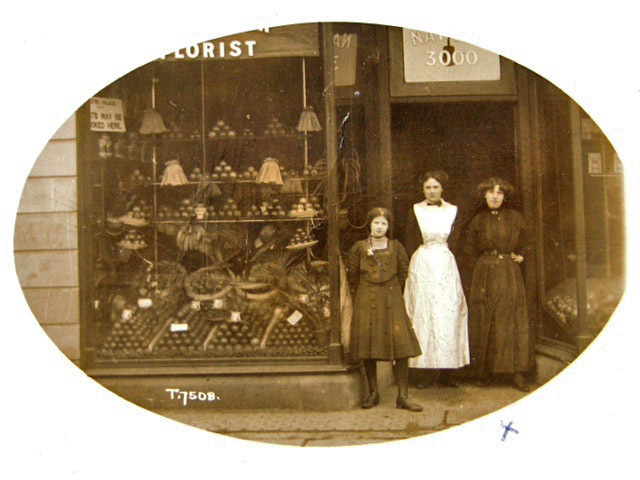 In the middle is her workmate – we only know that she was called ‘Maggie’ – and on the left is ‘Mary’, a shop assistant from Blenkinsop’s, the baker’s next door. And can you see the delivery boy? The notice on the left announces that tickets for Heaton’s Electric Palace cinema can be bought in the shop. At this time, the fruiterer’s was run by Mrs Sarah Smith, who also had a shop at 205 Shields Road and who lived at 98 Cardigan Terrace. Sarah was born in Bacton, Suffolk in c1852. By 1911, she was a widow, living with her four working sons, Jephtha, Elijah, Bertrand and Charles, plus a lodger. She had moved to Diss in Norfolk, where she met her husband, to work as a servant to a merchant there. Presumably, like many other people at that time, the young couple came to Newcastle because there were greater economic prospects in the industrial North. 1908: I left school in May at age of 14 years and started work in a small general shop wages 4/- per week, hours 9 am to 4 pm. Served in shop and helped with other household duties. My employers were an elderly couple who were very kind to me. 1909: Aged 15 years. Started work at Simpsons, 2 Raby Street, confectioners. Wages 5/- per week, hours 10 am till 10-30 pm. No time for meals and nobody to relieve me. Sunday duty 10-30 am till 10 pm, for which I got a day off during the week. No holidays then. Worked for nearly a year. 1910: Left and was off work six weeks then got work in fruit shop on Shields Road Byker 6/- per week. Hours 9 am till 9 pm (1 hour off for dinner) Monday to Thursday, Friday 10 pm, Saturday 12 pm. Before I got home it was 1 o’clock Sunday morning. People used to do their shopping after 10-30 pm when the theatres closed. Shields Road used to be quite busy then. My brother, twelve years old, was errand boy at weekends, Friday night 5 pm till 10 pm, Saturday 9 am till 12 pm, 1 hour for dinner, wages 1/6 and bag of fruit. He helped in the shop and ran errands and thought himself lucky if he got a penny. One old lady used to give him 2d for taking a heavy order of fruit and vegetables a mile away. 1911: Transferred to Heaton Road branch with girl 14 and errand boy to help wages 7/- per week and half-day on Wednesday. Left this shop and started work in Heaton at tobacconists and confectionary, 1912. Hours 8-30 am to 8-30 pm, 1 hour for lunch, half day on Tuesdays and one weeks annual holiday. Wages 8/- per week rising to 10/- when I had charge of the shop. Interviewed and paid all travellers and ordered all goods. Went to this job for three weeks and stayed four years. Bonus 10/- on the stock each six months. We cooked our own hams (6d per quarter pound) and sold fresh country eggs from Kirkwhelphington 12 a 1/-. Florence’s working conditions improved a little after the passing of legislation to improve the working condition of shop workers. You can actually see a newspaper board advertising the coming changes in our photograph of Millers Hill Bakery on Chillingham Road, taken at about the same time. The Shops Act 1911 granted shop assistants a half day holiday, set the maximum working week to 60 hours and made it compulsory to provide washing facilities in every shop. The block which includes 204 Heaton Road was built at the very end of the nineteenth century. To begin with, 204 was a residential property. It was first occupied by J Davidson, a tinsmith. The first shop in the premises was opened about 1904. It was from the outset a fruiterer’s, originally owned by Mrs Mary Eden, a Londoner who had married a fruit salesman from Leicester. In the early days, the shop changed hands many times. The following year, the proprietor was a Miss Edith Wright and only a year after that a Mrs J H Evans had taken it over. She lived at 68 Rothbury Terrace and had a second shop in Jesmond. Sarah Smith came next in 1909 but she too only stayed a few years. Around the outbreak of World War 1, the shop belonged to Miss Ellen Buchanan. Five proprietors in just over ten years. Only a year later, James Lillie became the first male owner of the shop. Sadly his tenure too was short-lived. James was born in South Shields in 1888. By 1911, aged 22 he was working as a grocery shop assistant. By 1915 he had married his girlfriend, Ada, and opened his own shop in a prosperous part of Heaton. His prospects were good. The world was already at war though and James joined the Northumberland Fusiliers and later Duke of Wellington’s West Riding Regiment. He was killed in action on the Somme on 12th October 1916 and is buried in the London Cemetery and Extension in Longueval, Somme, France. James was commemorated on a memorial in Leighton Primitive Methodist Church and Sunday School. When the church was pulled down, this plaque was apparently removed to Cuthbert Bainbridge Memorial Methodist Church which itself has since been demolished. The North East War Memorials Project is trying to find out what happened to the plaque and to the church’s stained glass windows. 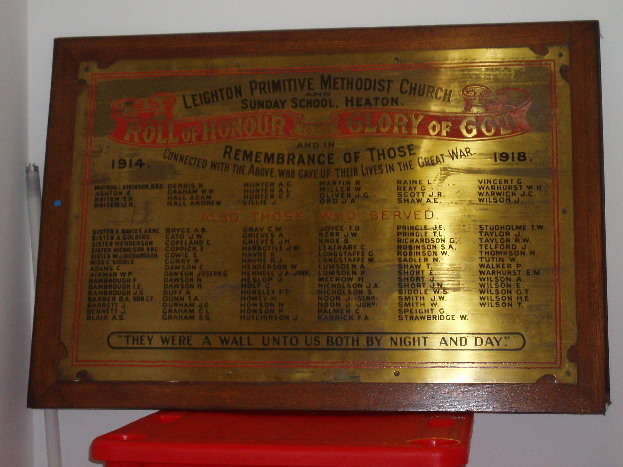 Please get in touch via Heaton History Group (chris.jackson@heatonhistorygroup.org) if you can help locate it. After the war there was a change of use. Miss Mary Gibson acquired the shop and her business was destined to last. Mary was born in Amble in 1877. She trained as a dressmaker and lived for much of her the adult life at 106 Meldon Terrace, firstly with her sister and then alone. The shop she opened was a milliner’s. As it didn’t close until the late 1940s, some older readers may have memories of buying a hat there? We’d love to hear more about Miss Gibson and the shop she ran for thirty years. But by 1950 hats were becoming less universally worn and more people were buying clothes in large department stores. Milliners were already disappearing from places like Heaton Road. Once Miss Gibson retired, it was time for another change of direction. The next business lasted even longer. In the early 1950s Gerald Walden, an optician, took over the shop. He was still at number 204 in 1995, having in the meantime expanded with shops in Forest Hall and Denton. Who remembers having their eyes tested or buying their glasses there? As usual, we’re looking for your help? Can you add to what we’ve written? What do you know or remember about 204 Heaton Road? Do you remember the milliner’s or the optician’s? Can you fill in the gap between Walden’s closing and Heaton Property opening? And can you help us track down the missing war memorial? Please contact Chris Jackson (chris.jackson@heatonhistorygroup.org)if you can answer any of the above or if you have any information or photographs which help tell the story of Heaton. This entry was posted in Research and tagged bakery, Blenkinsop, Cardigan Terrace, churches, cinema, Cuthbert Bainbridge Memorial Methodist Church, Florence Webb, florist, fruiterer, Gerald Walden, greengrocer, Heaton Electric Palace, Heaton Property, Heaton Road, James Lillie, Leighton Primitive Methodist Church, Mary Eden, Mary Gibson, Meldon Terrace, milliner, optician, plaque, Rothbury Terrace, Sarah Smith, Shields Road, shops, Simonside Terrace, tinsmith, war memorial, WW1 on January 10, 2014 by oldheaton.